This review has not yet been approved by the owner of this writing service. If you are the webmaster of Buycourseworkonline.co.uk, please Contact Us to approve or remove this review. The site itself is completely useless. The only helpful things are the e-mail address of the service and work samples (if you believe they are have anything to do with the actual employees of the site). The design itself can be called questionable at the very best: menus take a few second to load every time you open a new page, which is very, very annoying. The prices range from about $17 per page to about $30 per page, the defining factors being the size of the assignment, its academic level, overall complexity and deadline. The site is rather secretive about how much different kinds of tasks cost exactly, so this information is all you are going to have – the only way to find out how much you are going to pay for a particular service is to send them details of your order. There is only one way to get in touch with the service – e-mail. There is, of course, a query form as well, but you will receive the answer via e-mail nonetheless, so for all practical purposes there is no difference. There is also fax, but you can only get its number from support (if you want it for some reason, of course). Fortunately (and not a little bit surprising) the e-mail support really functions 24 hours a day, and it is really staffed with competent people. There are several samples on the site and, provided they really have been written by the employees of this service, they generally produce a rather favorable impression. Not all of them: some works are obviously written by people who had nothing else in mind but to cover the word number requirements, filling their work with constant repetitions and bland statements. You can choose language style. 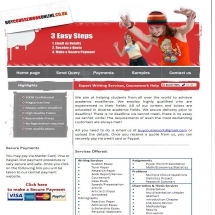 All in all, one can’t say that BuyCourseworkOnline looks like a very trustworthy writing service. No registration? Why is it a good thing? It means that I won’t get any bonuses as a return customer and won’t be able to control all my orders from a centralized interface. No refunds, but free revisions for 3 months? Are they even serious? If I need an assignment in a week and they won’t provide it, what’s the use of getting it, even perfectly written, in 3 months’ time?